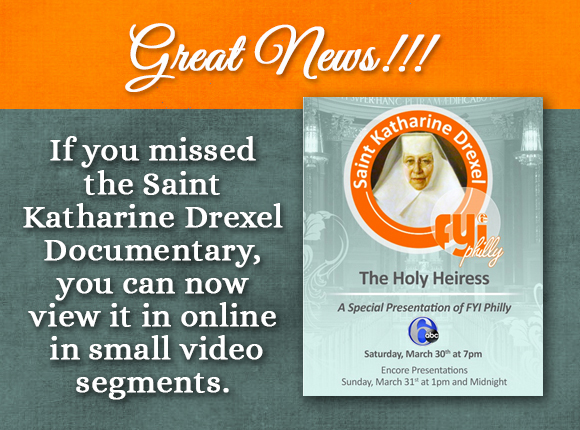 Now you can view the documentary on St. Katharine Drexel in small segments online! See below for the segment list and video links! On March 30th and 31st, a documentary on St. Katharine Drexel aired on ABC6 Philadelphia detailing the family life, religious life and her road to beatification and canonization. If you did not have the opportunity to view the FYI Philly Special, you can see segments from this documentary by clicking on these series of three-and-a-half to eight minute long videos of each phase of her life they highlighted. 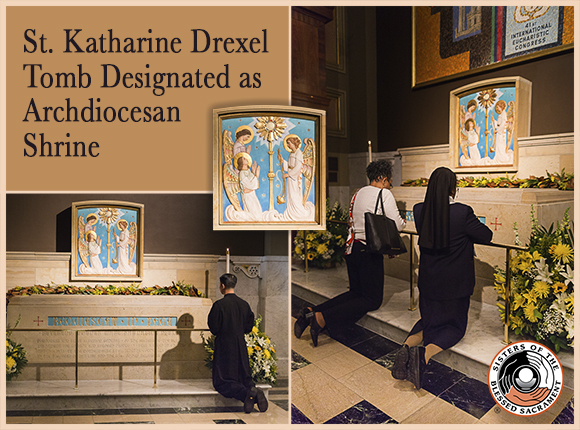 St. Katharine Drexel Tomb Designated as a Philadelphia Archdiocesan Shrine. 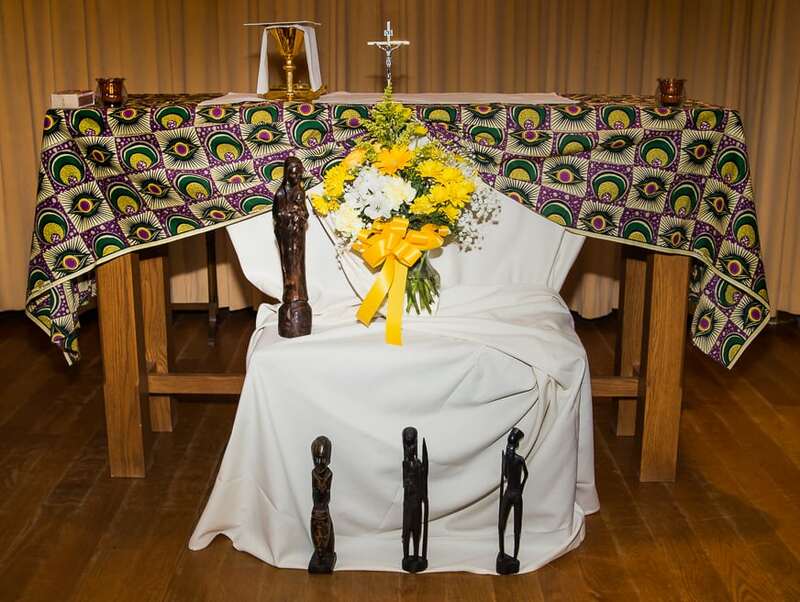 New Shrine at the Cathedral will be one of Five in the Diocese! 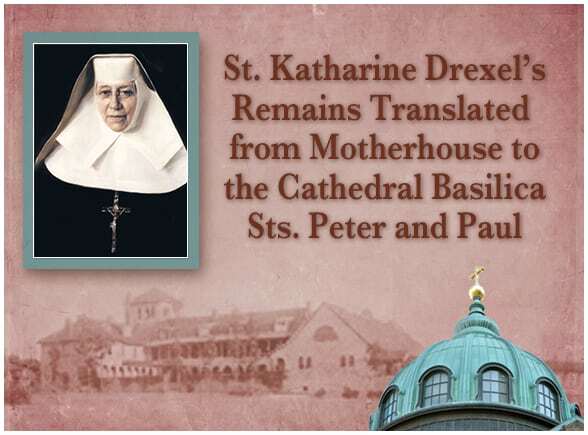 At a press conference on Feb. 28, 2019, just days prior to St. Katharine Drexel’s Feast Day on March 3, the Archdiocese of Philadelphia announced that the relocated tomb of Saint Katharine will be designated as an Archdiocesan shrine —one of five within the Archdiocese. The sandstone tomb of the saint now resides below a mural that was designed by Lendo Velasco to celebrate the 100th anniversary of the Archdiocese of Philadelphia. It is situated in the rear of the Cathedral Basilica of Saints Peter and Paul, on the chapel side, in close proximity to a side altar donated in the 19th century by St. Katharine and her two sisters as a memorial to their deceased parents, Francis and Emma Drexel. Katharine’s family name was, and still is, well-known within the community. Katharine Drexel, a Philadelphia heiress, gave up her affluent lifestyle to dedicate her life as a nun in service to marginalized communities, specifically the black and Indian peoples of her time. She founded her order, the Sisters of the Blessed Sacrament, in 1891. 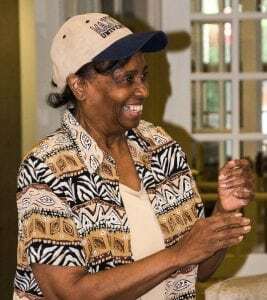 Through her lifetime she supported nearly 60 schools and missions throughout the United States and abroad, most notably Xavier University, the only historically black Roman Catholic institution of higher education in the United States. Her life-long ministry and recognized miracles lead to her beatification in 1988 by the Catholic Church, followed by her canonization in 2000 by Pope John Paul II — who himself, was later canonized a saint in 2014. 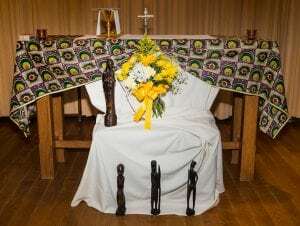 The translation of St. Katharine Drexel’s tomb from the former National Shrine location on the 44-acre motherhouse property in Bensalem was a large undertaking funded by a grant from the Connelly Foundation. It was carefully coordinated with the joint efforts of the Sisters of the Blessed Sacrament, whose property is presently for sale, and the Pastor/Rector of the Cathedral, Rev. Dennis Gill. 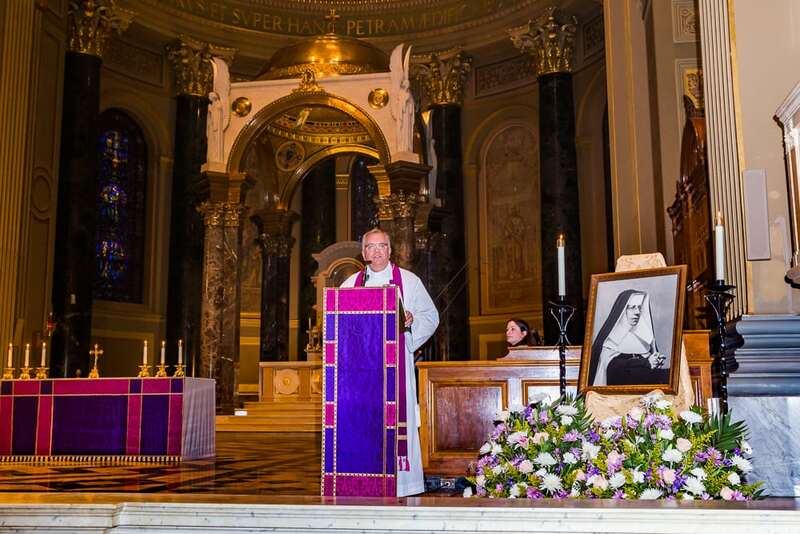 The new site of the Shrine of St. Katharine Drexel, located in downtown Philadelphia, will allow more tourists and devoted pilgrims to visit St. Katharine Drexel’s Shine as well as the other four shrines in the Archdiocese. In addition to the shrine, Rev. Gill announced that there will be a new website, a documentary in-the-works, and future education programs about Saint Katharine Drexel. For more information, please view the Diocese website. 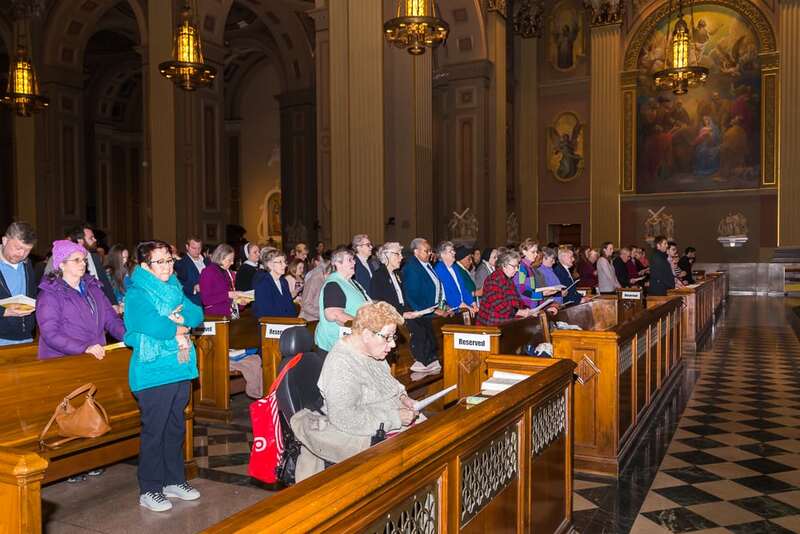 The Sisters of the Blessed Sacrament look forward to you joining us at the Principal Mass at 11 AM at the Cathedral Basilica of Saints Peter and Paul at 18th and Benjamin Franklin Pkwy. There will be a pre-Mass concert starting at 10:45 a.m. in St. Katharine’s honor. Click on the image or this link to view and download the flyer. Feb. 22 – Mar. 2, 2019. Click here for our Novena page. 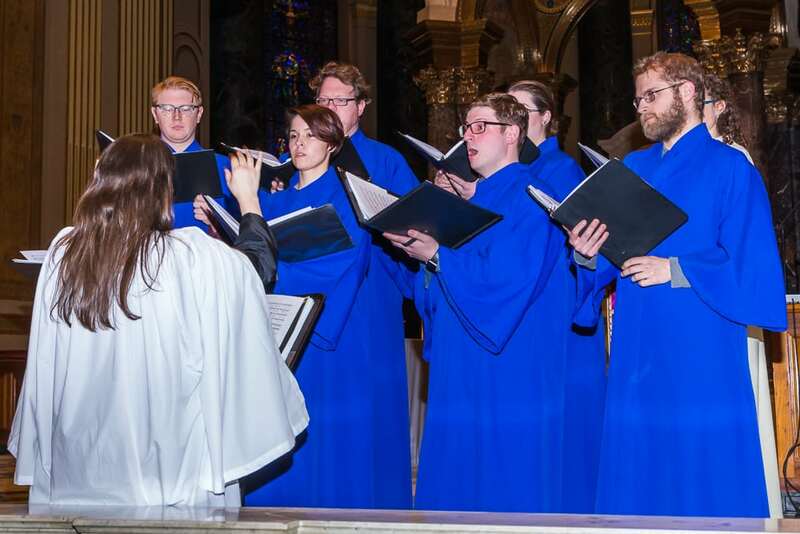 While attendees arrived at the Cathedral for Sunday Mass, they were treated to the wonderful vocals of the visiting Xavier University Concert Choir of Louisiana, as well as the local talents of the Cathedral Basilica Choir, Archdiocesan Children’s Choir, and the Archdiocesan Choir of Philadelphia prior to the start of the special service. 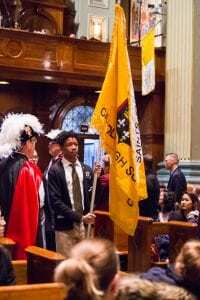 The 11:00 a.m. Solemn Mass began with a procession of local, Catholic High School student representatives bearing flags from their schools, members of the Knights of Columbus, seminarians, and clergy members, including celebrant & homilist, Archbishop Charles J. Chaput, O.F.M., Cap. Signing was provided for the hearing impaired, who sat in reserved seating up front. 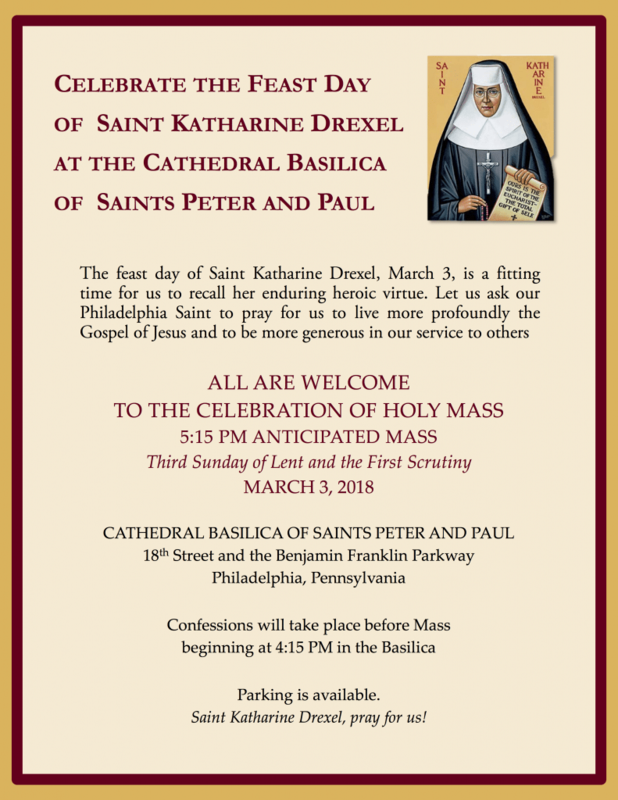 Also sitting in reserved seats were a group of Drexel family members, recipients of the miracles that lead to St. Katharine’s beatification, some of the Sisters of the Blessed Sacrament, the congregation founded by St. Katharine Drexel, and some of their Associates. 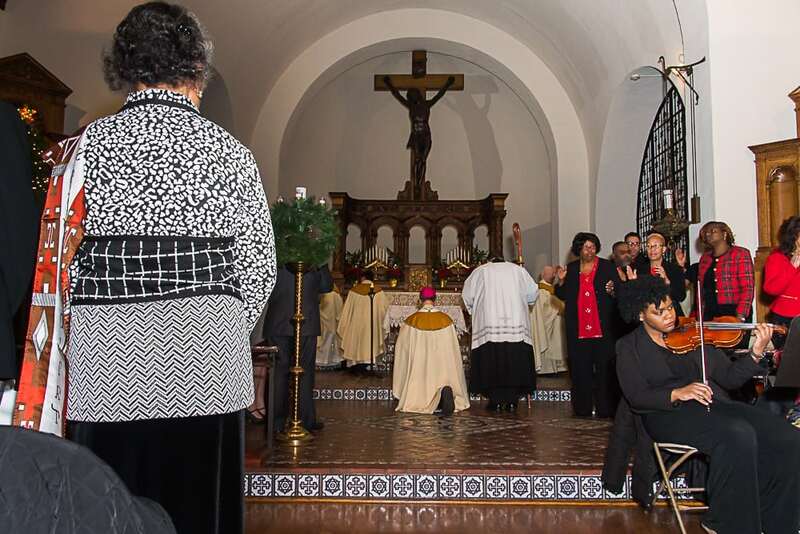 The side aisles and separate chapel were filled to capacity with a diversity of ages and races. 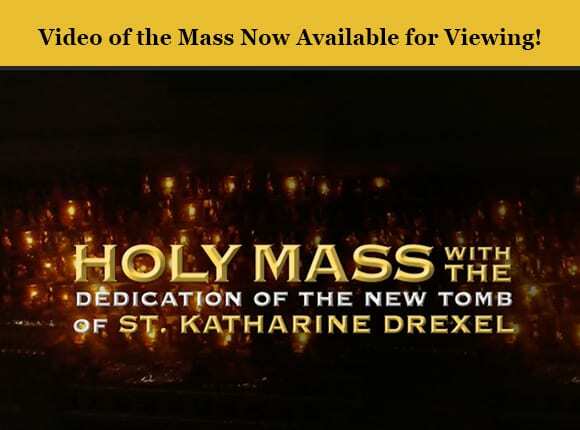 The newly installed tomb with the sacred remains of St. Katharine Drexel was blessed while those in attendance listened/viewed on various televisions displayed throughout the Cathedral. Co-celebrant, Rev. 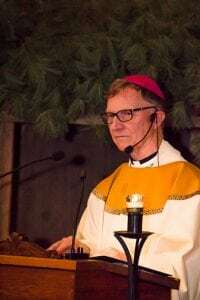 Gerald Dennis Gill, Rector and Pastor of the Cathedral, wrote the lyrics to the beautiful welcome hymn which paid homage to the saint and her mission. 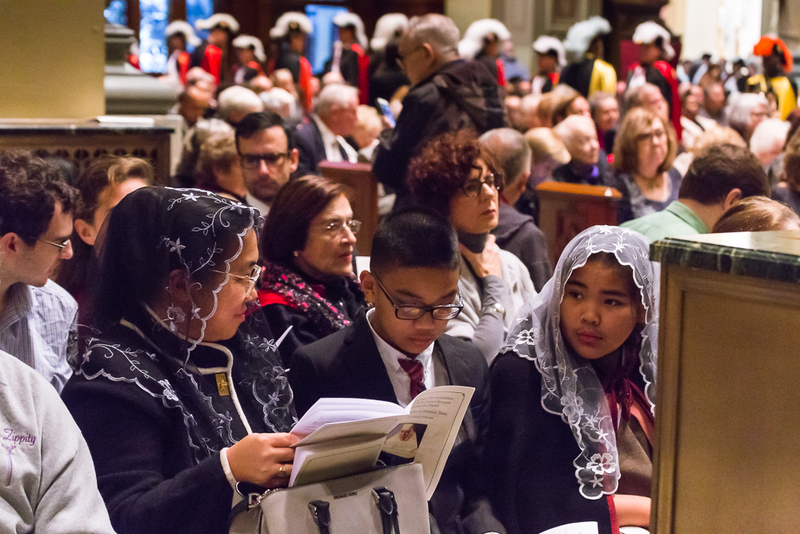 The liturgy included readings in English and Spanish accompanied by translations in the Mass programs. 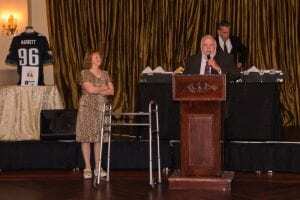 Click above to view a snippet of Sr. Donna Breslin’s speech. Sr. Donna Breslin, president of the Sisters of the Blessed Sacrament briefly spoke about St. Katharine Drexel and the new location of her sacred remains at the Cathedral Basilica of Saints Peter and Paul as a “coming home for our foundress who prayed and worshiped within these very walls.” She received a hug from the Archbishop and a standing ovation from all in attendance. 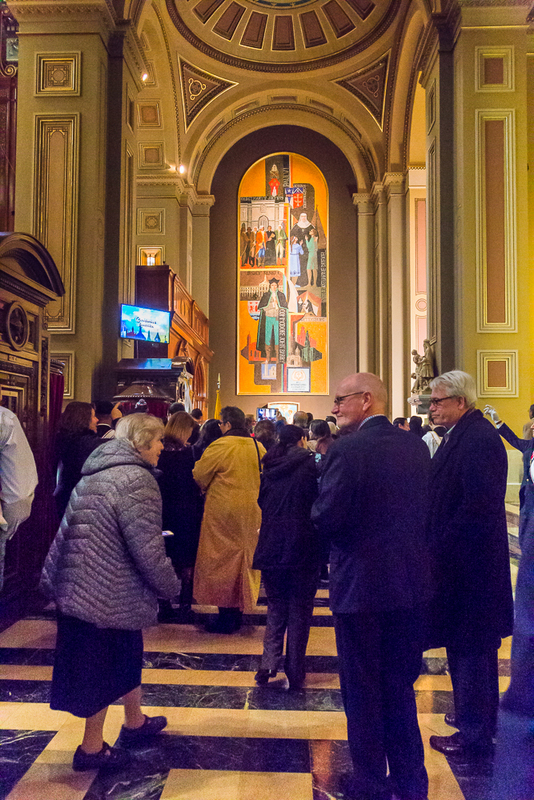 Attendees were able to visit the tomb of St. Katharine Drexel prior to and after the celebration of the Mass. Many lined up to pray and take pictures in front of her tomb and visit the Drexel Family side altar adjacent to it. A development fund has been established to install additional lighting and signage in the future. A new website for information and updates has also been developed by the Archdiocese of Philadelphia. You can view that at: www.saintkatharinedrexelshrine.com. To view the EWTN video of this mass, click here, or scroll below to the story and link posted previously on this page. Now you have a chance to view the video! Click here or on the graphic above to view the video. Archbishop Charles J. Chaput, O.F.M. Cap. 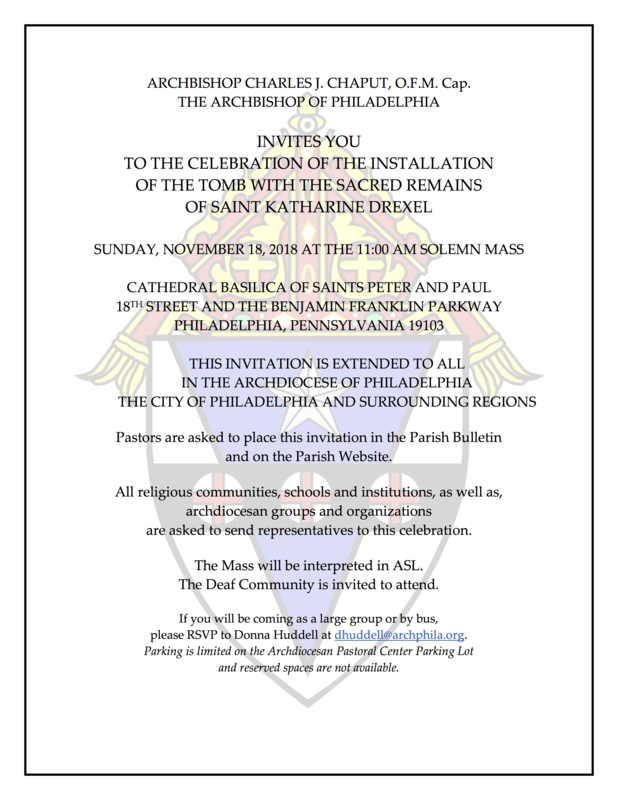 of the Archdiocese of Philadelphia issues a formal invitation to all who would like to attend the Celebration of the Installation of the Tomb with the Sacred Remains of Saint Katharine Drexel, which is to be held on Sunday, November 18, 2018 at the 11:00 a.m. Solemn Mass at the Cathedral Basilica of Saints Peter and Paul in Philadelphia, Pennsylvania. To view and/or download the flyer, click here or on the graphic on the right. For additional information and updates, click here. It will continue to be updated as the full site is developed. Cathedral Basilica in Philadelphia, PA.
For more details and updates regarding this, click here. 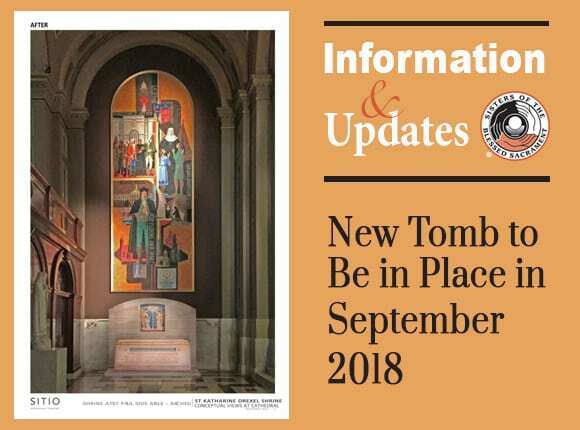 UPDATE: The New Tomb is Now Open to the Public! The Installation of the Tomb of Saint Katharine Drexel will take place on Sunday, November 18, 2018, with the 11:00 AM Solemn Mass at the Cathedral Basilica. Click this link for more information. 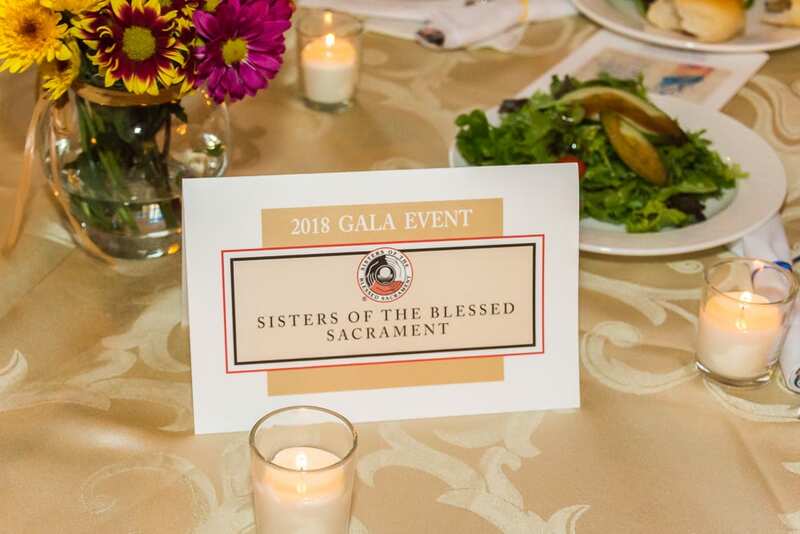 On Sunday, Sept. 23, 2018, supporters and friends of the Sisters of the Blessed Sacrament looked stylish as they attended the annual GALA Event. 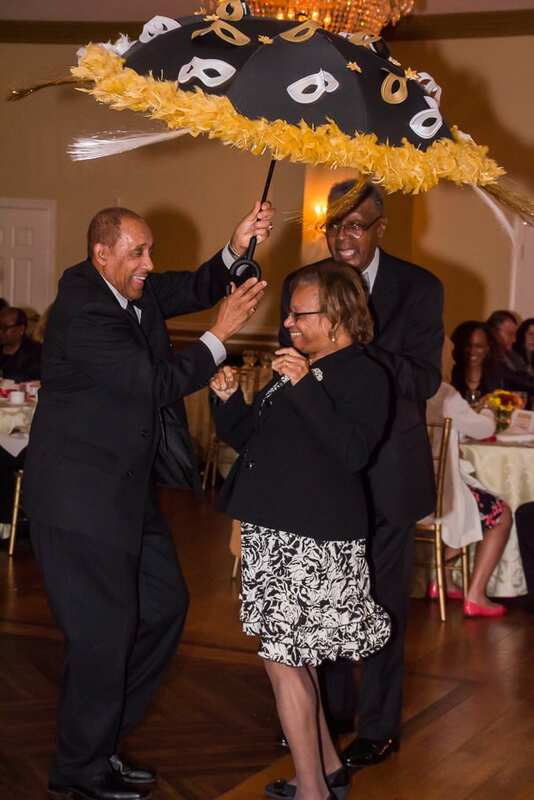 Although rain fell outside of the Belle Voir Manor at Pen Ryn Estate on the Delaware in Bensalem, PA, it was nothing but smiles and a bright, cheery atmosphere indoors. The guests enjoyed appetizers while chatting and viewing prizes for the auction and drawings in the beautiful reception area. 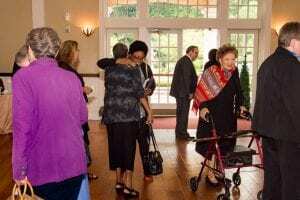 Following the cocktail hour, attendees enjoyed a buffet dinner, music by DJ Bobby O, and the presentation of the 2018 St. Katharine Drexel National Justice Award to Sr. Patricia Daly, Op. You can read more about her accomplishments on our GALA Event Page and on our Special Features page. Next, there was a live auction for a catered dinner by D&H Caterers which included a very special guest, Bob Gutherman, recipient of one of the miracles which lead to St. Katharine’s Beatification. An autographed Eagles Jersey by Derek Barnett was another popular item available to bid on as George and Tina Gerlach co-hosted the live auction. The excitement continued with the prize drawing, 50-50, and the money raffle drawings. 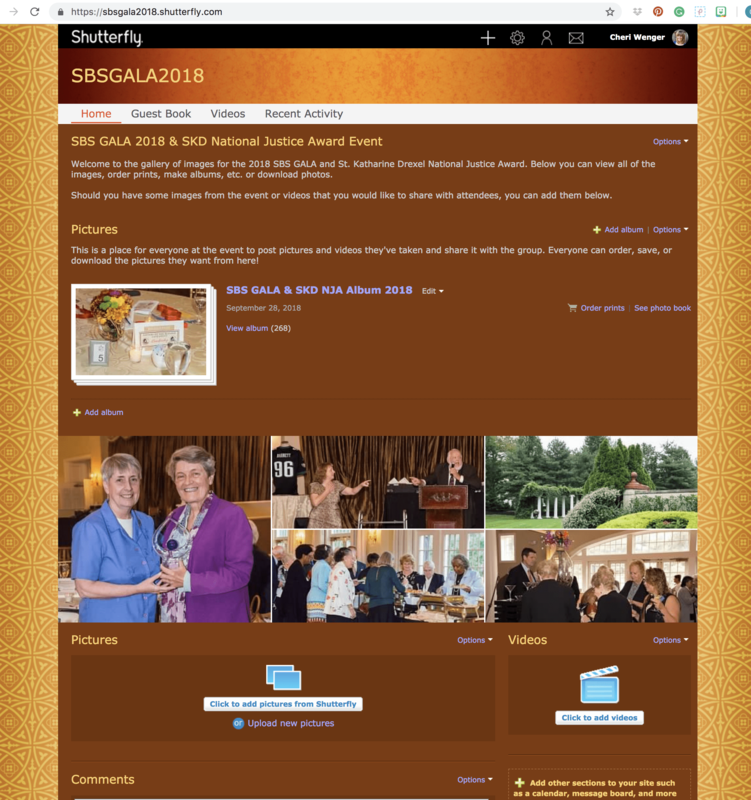 A list of the winners can be viewed on our updated GALA Event page. 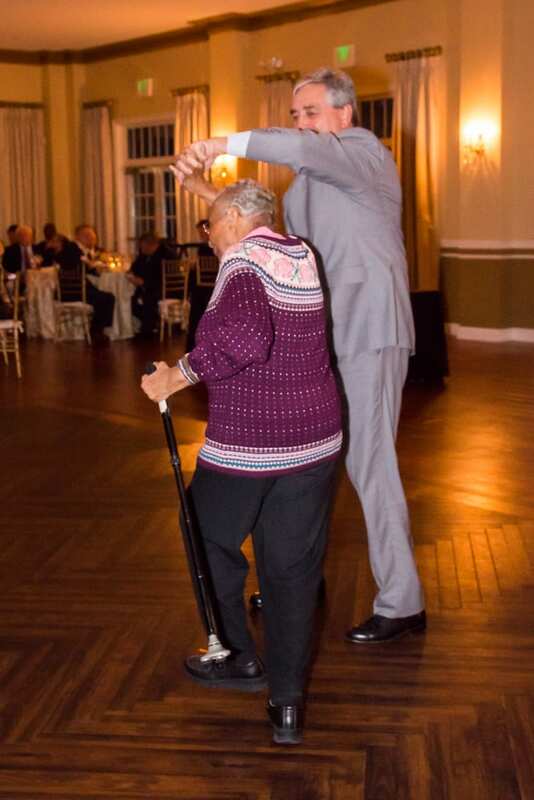 As the evening progressed and the music livened up, so did the dance floor. 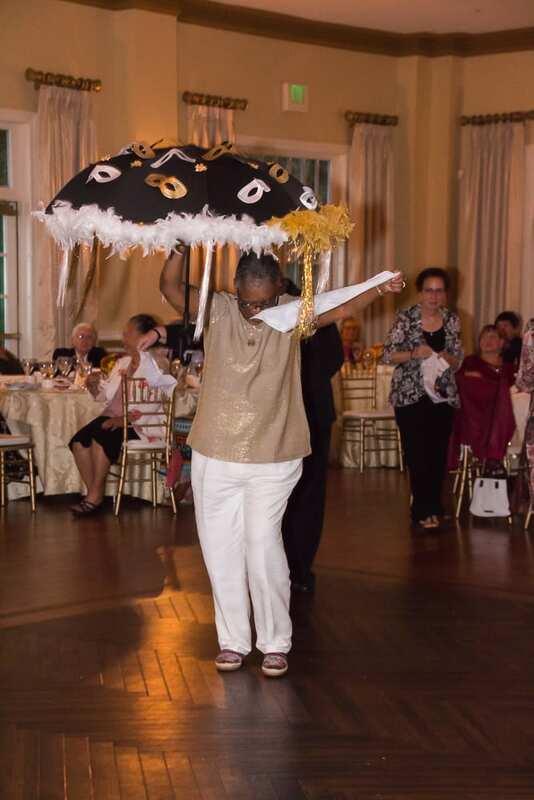 It was filled with couples, groups and second line dancing…a New Orlean’s tradition, with our friend, Lynn Honoré, leading the way! We would like to thank all who attended, sponsored, donated prizes, time, energy and money to make the 2018 GALA a success. Hats off to the committee members who worked tirelessly behind the scenes, and all those involved in making it such a wonderful evening! Anne DeMarco, Associate of the Sisters of the Blessed Sacrament, holds up the hankies commemorating the SBS presence in New Orleans. To view a mini album of highlight photos from our GALA on our SBS Facebook Page, click this link. 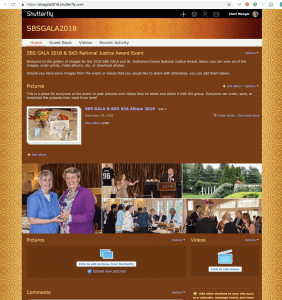 To view, download, print or upload photos & videos of your own to our GALA 2018 Shutterfly Share Site, click here. The GALA is always a wonderful occasion for people to catch up with one another while supporting the ministry efforts and the Sisters who continue to follow in the footsteps of St. Katharine Drexel. We look forward to seeing you at next year’s event! On June 23, 2018, the auditorium at Paul’s Run Retirement was beautifully transformed by Sr. Lynn Marie Ralph, SBS, for a joint celebration of the Sisters of the Blessed Sacrament’s 60th and 70th Jubilees since entrance. Four Sisters were there to renew their vows and celebrate these milestones in their ministry, however a fifth Sister, Sr. Catherine Joseph Bennett, SBS, sadly passed away just days before celebrating her 70th Jubilee. 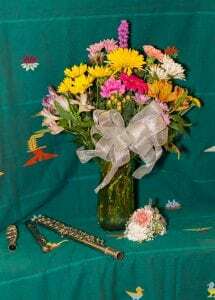 A flute was placed at the lectern in her honor along with the corsage that she would have worn. Rev. Stephen D. Thorne, pastor of St. Martin de Porres Parish and friend of the SBS, celebrated the mass. Familiar with the life and teachings of St. Katharine Drexel, Rev. Thorne spoke about how St. Katharine embodied the words…faith, resilience and love …attributes which all of these Jubilarians exemplify. Following the wonderful Jubilee Mass, the room was further transformed so that those in attendance could enjoy a small reception with food and beverages in honor of the Jubilarians: Sr. M. Catherine Joseph Bennett (70th – not in attendance); Sr. M. Ann Elizabeth Lamsback, SBS (70th); Sr. Nathalee Bryant, SBS (60th); Sr. Jeanette Kinlicheeny, SBS (60th) and Sr. Roland Lagarde, SBS (60th). To see more images from our Jubilee, click this link to view our Facebook SBS Jubilarians & Jubilees 2018 album. To view Sr. Catherine’s memorial album, click here. Far Left: Sr. Jeannette Kinlicheeny, SBS, hugs fellow Jubilarian, Sr. Anne Elizabeth Lamsback, SBS, following the celebration of the Mass. Left: Sr. Roland Lagarde, SBS, poses with the Jubilee Mass program in front of the decorated altar. 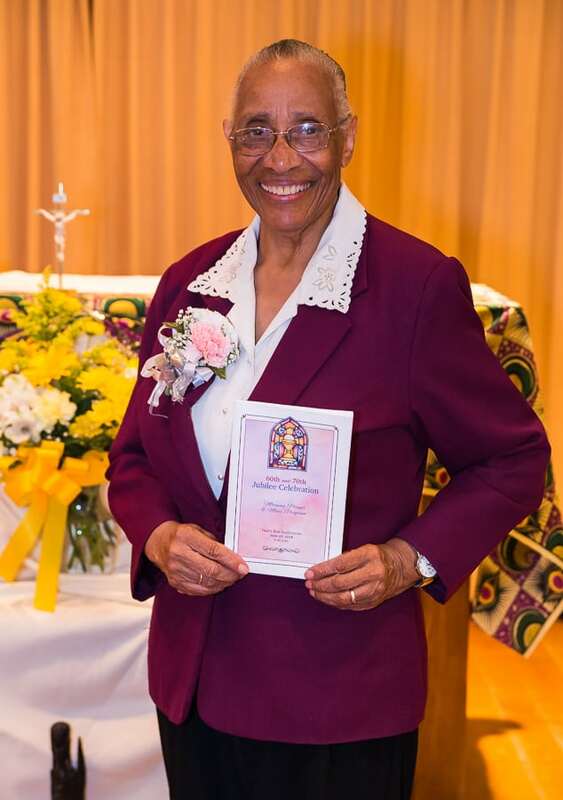 Right: Sr. Nathalee Bryant, SBS, smiles brightly prior to the Jubilee celebration. If there is jazz music in the air, you can be assured that Sr. Roland Lagarde, SBS, will not miss out on the experience. She lead the jazz band outdoors to the applause of many appreciating her 2nd line dancing. 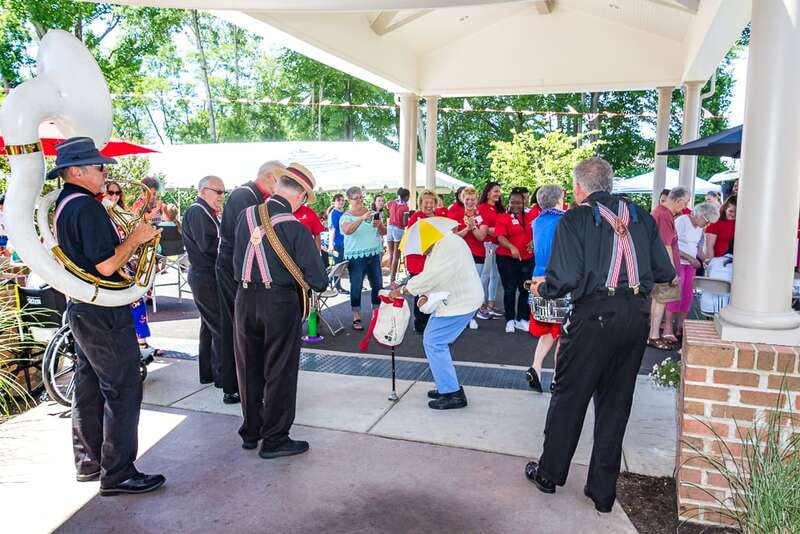 Although the Annual Summer Picnic had to be rescheduled due to prior rainy weather, on June 14, 2018, the sun was shining brightly upon the residents, volunteers and workers who attended the event at Paul’s Run Retirement Community, including our very own Sisters of the Blessed Sacrament. 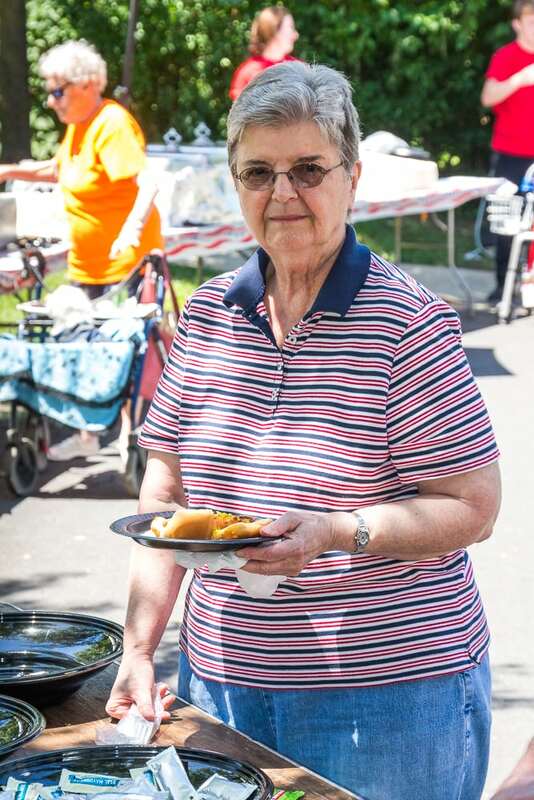 Sr. Marilyn Foy, SBS, fixes her plate of picnic goodies… including a burger from one of the food tables. The parking lot area was lined with tables and chairs under large white tents providing a reprieve from the hot sun. 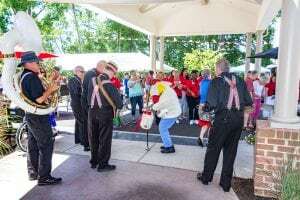 The air was filled with conversations, music from a DJ, and later in the afternoon, the cheerful melodies of a jazz band performed in the lobby as well as outdoors. 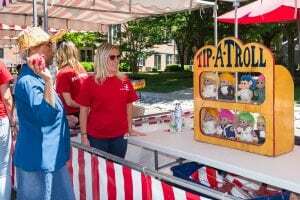 Residents, workers, their children and some of the residents’ families enjoyed a little dancing, a delicious BBQ, popcorn and some cotton candy…all summertime favorites! For activities, there were carnival games and prizes, henna tattoos and a sand art booth. 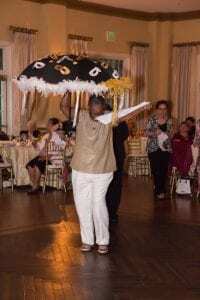 Our energetic Sisters, Roland Lagarde and Marjorie Everett enjoyed some Second Line dancing to the New Orlean’s style music in the lobby. Sr. Roland, who is a native of New Orleans, lead the parade through the front entrance to continue the dancing outside. 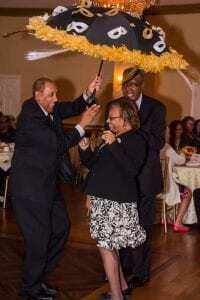 Donning her yellow and white striped umbrella hat, Sister put on a show and gained much applause for her exuberance. She later danced with a male resident, whom I heard was in his nineties, who also shared her excitement for the music that day. 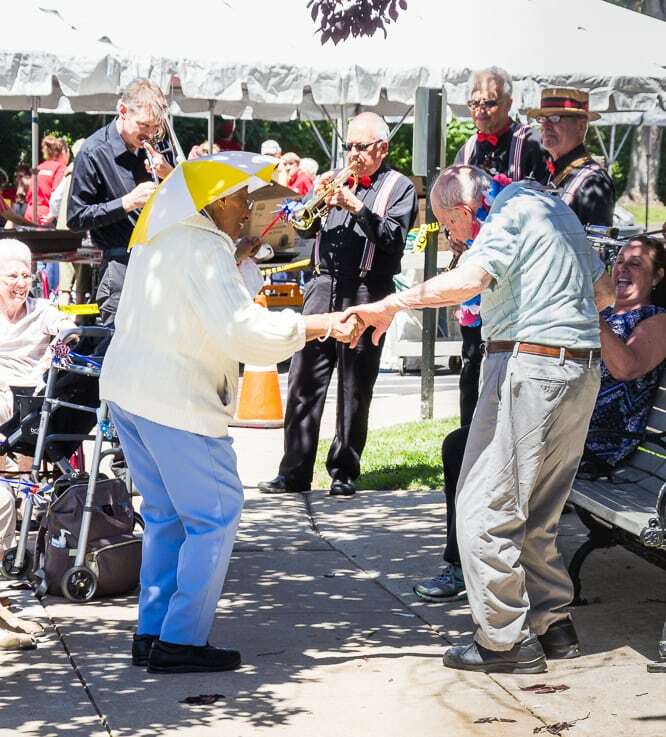 Some residents navigated with their rolling wheelchairs, some even bringing their pets with them, and others were escorted by nurses who enabled all who were willing to enjoy the fun festivities that day. As you can see by the pictures, our SBS enjoyed being in the company of one another, and they appreciated spending time with all who attended the wonderful Summer Picnic held at Paul’s Run. To view the full album of photos added to our Facebook page, click here. All smiles, Sr. Amédée Maxwell, SBS, enjoys the indoor entertainment at the picnic. Sr. Geraldine Mikulec, SBS stops for a photo by one of the food tents set up. Sr. M. Norbert Moline, SBS, takes her shot at the Tip-A-Troll game…winning a pinwheel prize for knocking one down! Way to go Sr. Norbert!!! 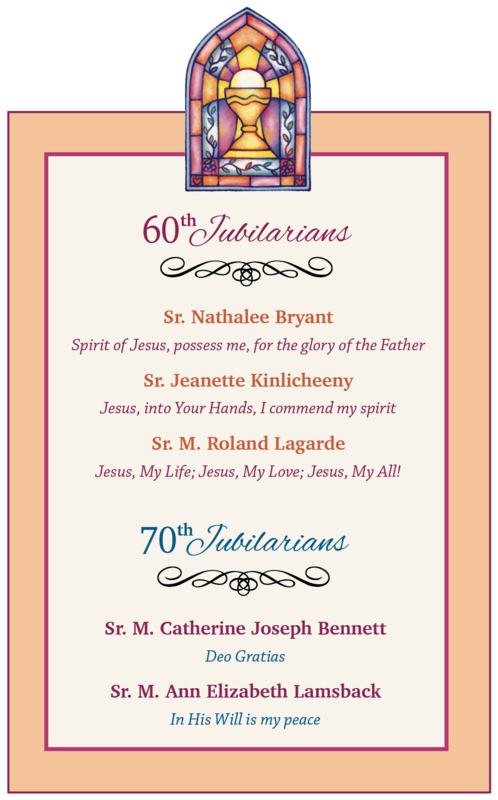 On June 23, 2018, at Paul’s Run Retirement Community, we recognize the following Sisters of the Blessed Sacrament who are celebrating their 60th/70th anniversaries since entrance. Regretfully, one of our 70 yr. Jubilarians, Sr. Catherine Joseph Bennett, has gone on to her eternal reward just three days shy of the Jubilee celebration. 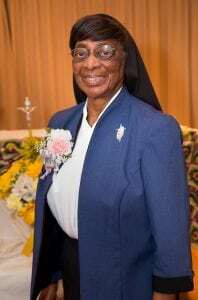 We ask that you hold Sr. M. Catherine Joseph Bennett, SBS, her family and friends in your prayers during this difficult time. Information regarding her funeral arrangements can be found on our In Loving Memory page or by clicking here. 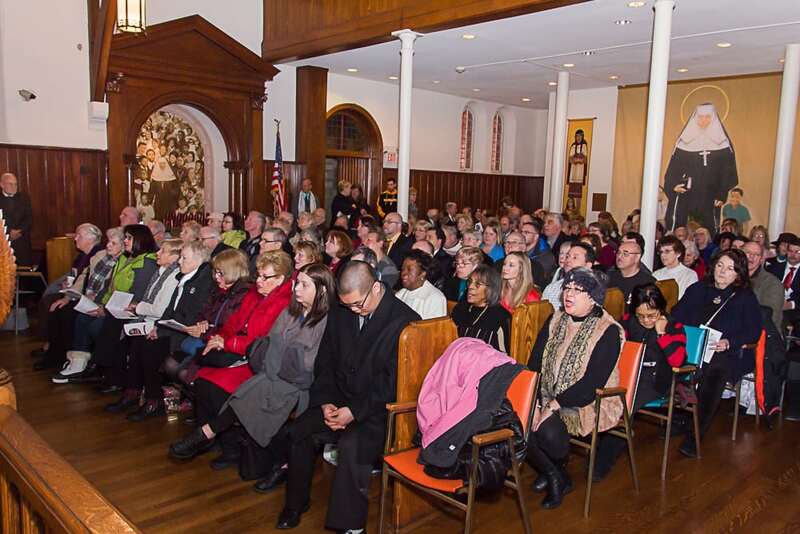 The Sisters of the Blessed Sacrament, SBS, were joined by some of their Associates, and the public to honor their foundress, St. Katharine Drexel, on her Feast Day, March 3, 2018. A beautiful evening Mass was celebrated by Pastor, Rev. 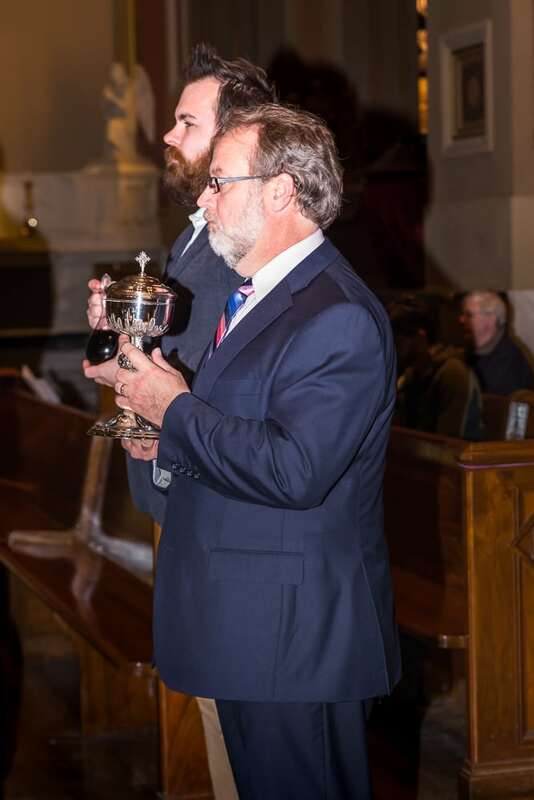 G. Dennis Gill, at the Cathedral Basilica Saints Peter & Paul in Center City Philadelphia. St. Katharine’s photo was beautifully displayed on the altar surrounded by flowers and candles to remind those in attendance of her saintly virtues and accomplishments. The amazing choir added their voices to make it a very beautiful and joyful celebration. Above: Rev. F. Dennis Fill, Pastor of the Cathedral Basilica Sts. Peter & Paul welcomes everyone who came to honor St. Katharine and attend Mass on her Feast Day. 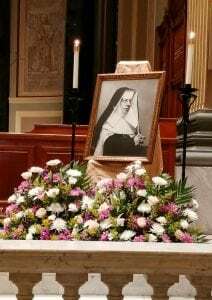 Left: A framed photo of St. Katharine Drexel was displayed on the right side of the altar. President of the SBS, Sr. Donna Breslin, welcomed worshipers to Mass and reminded all of the inspiration that St. Katharine provides for the world today — calling us all to seek peace, social justice, and to offer hope to the marginalized. Below: The Sisters of the Blessed Sacrament, Miracle Recipients, Associates of the Sisters of the Blessed Sacrament and some of the local church community came to honor the Saint on her Feast Day. Right: The brother of miracle recipient, Amy Wall joined miracle recipient Robert Gutherman, whose hearing was also restored through prayers to St. Katharine to bring up the offertory gifts. 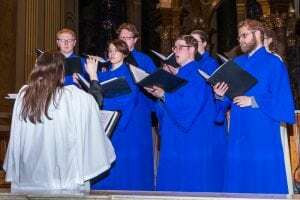 Left: The Chorus added their voices to make it a beautiful Feast Day Mass at the Cathedral. 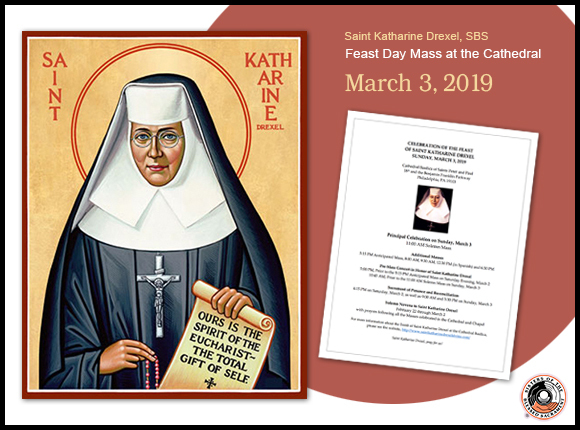 The annual Feast Day Mass for St. Katharine Drexel will continue to be celebrated at the Cathedral, and all are invited to attend. 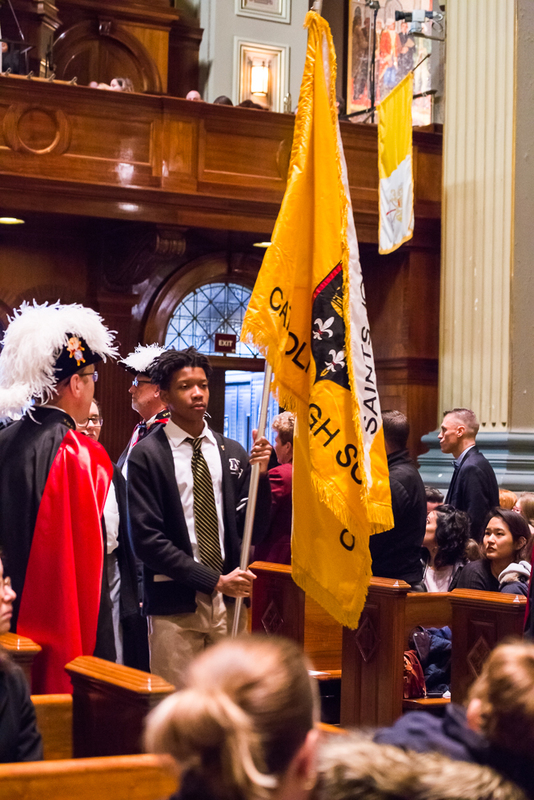 To view images from the 2018 Feast Day Mass on our SBS Facebook page, click here. A final, private “Mass of Thanksgiving” in St. Elizabeth Chapel at the National Shrine of Katharine Drexel was held at 2 p.m. on December 31, 2017. 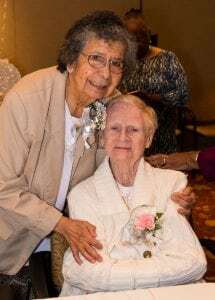 The Sisters of the B lessed Sacrament were joined by current and previous employees, volunteers, Associates and Clergy to offer praise and gratitude for the Eucharistic ministries and treasured relationships initiated there. St. Martin De Porres multi-talented musicians and Gospel Choir brought a joyful tone to the event. 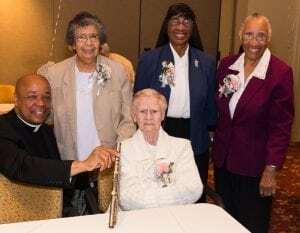 Bishop Deliman of the Archdiocese of Philadelphia concelebrated the mass with almost a dozen various clergy members with close ties to the Sisters. The bishop noted in his homily St. Katharine’s fearless attitude of service and her visionary spirit…perfect inspiration for all present to further the Mission of the SBS. 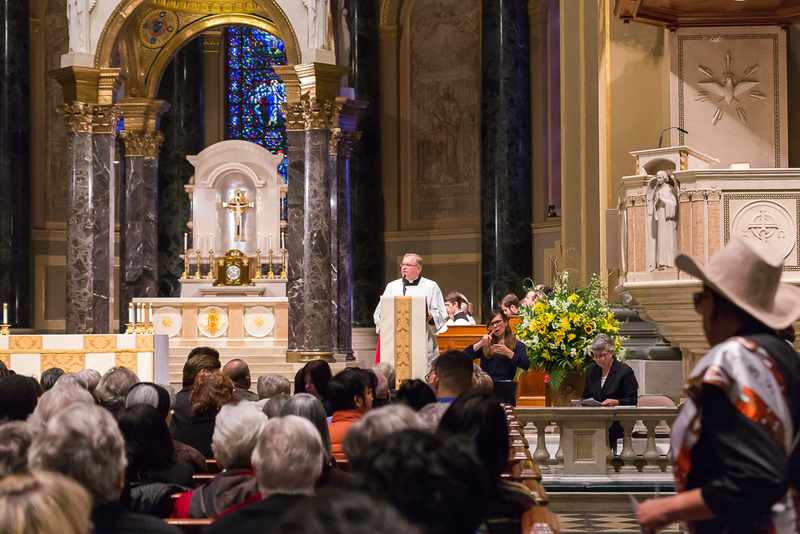 Above Left: Bishop Deliman gives his homily and highlights St. Katharine’s fearlessness. Above Right: Final Mass concelebrated at St. Elizabeth Chapel on Dec. 31, 2017. St. Elizabeth Chapel was built by St. Katharine in 1892 as part of the original motherhouse. Nearing its’ centennial year, renovations began in 1988 in accordance with the Second Vatican Council. St. Elizabeth Chapel still stands today as a symbol of love and sacrifice that St. Katharine and the Sisters of the Blessed Sacrament made over the years. 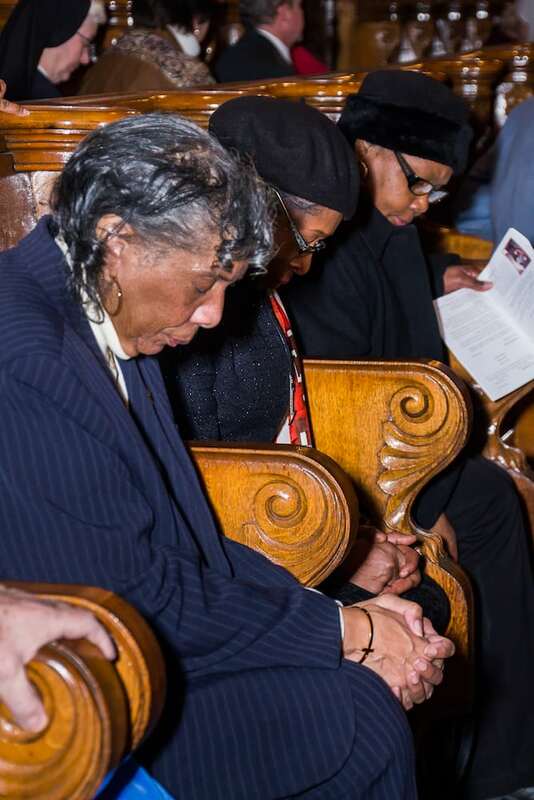 Left: Attendees pray quietly after communion. 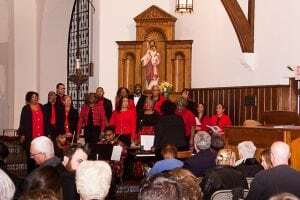 Right Top: St. Martin De Porres Gospel Choir and musicians added their talents to the Mass. 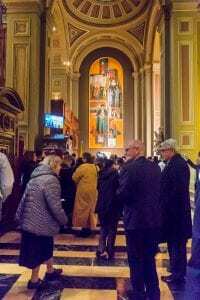 Right Lower: Many guests packed the back of St. Elizabeth Chapel which showcases the banner from St. Katharine’s Canonization Ceremony held at the Vatican in Rome. You can also view and tag yourself in images from the event in our SBS Facebook page album. 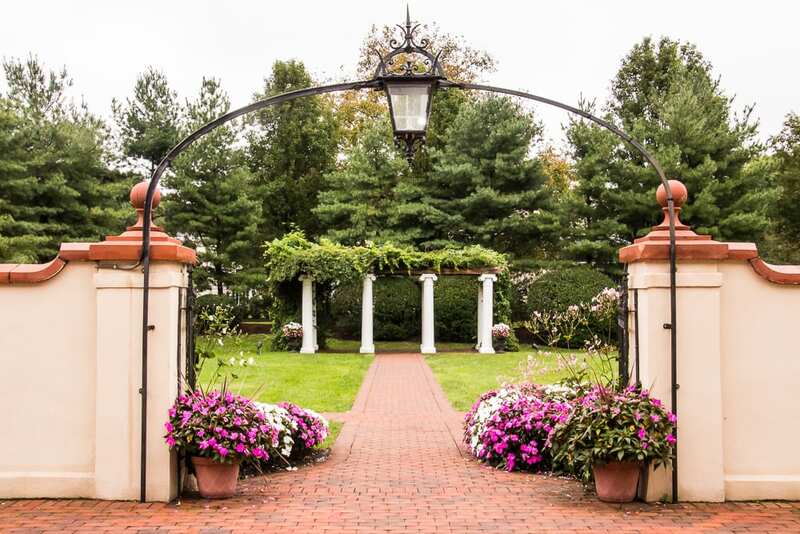 The Sisters of the Blessed Sacrament are selling the historic, gracious 44-acre property in Bensalem, Penn., which Mother Katharine Drexel purchased to build the Motherhouse for the religious order she founded in 1891. 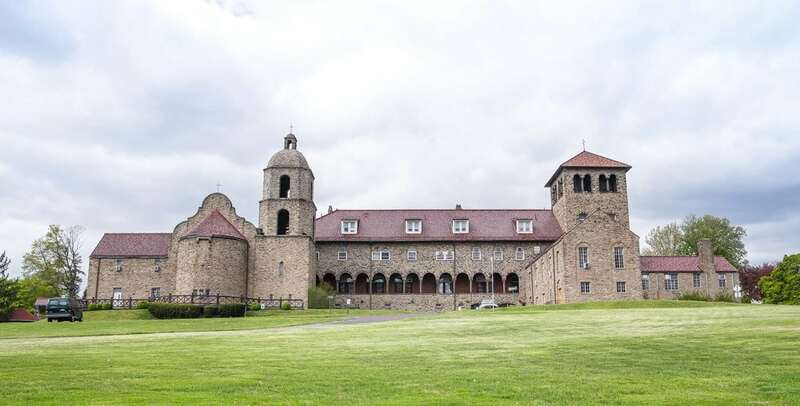 The Congregation also is selling more than 2,200 acres in Powhatan, Va., near Richmond, the former site of two schools for black students: St. Francis de Sales for girls and St. Emma Military Academy for boys. Colonel Edward Morrell, Mother Katharine’s brother-in-law, acquired this land in the early 1890s. Later, the land was transferred to the Congregation. The National Shrine of Saint Katharine Drexel on the Motherhouse campus remains open and continues to welcome visitors through 2017. 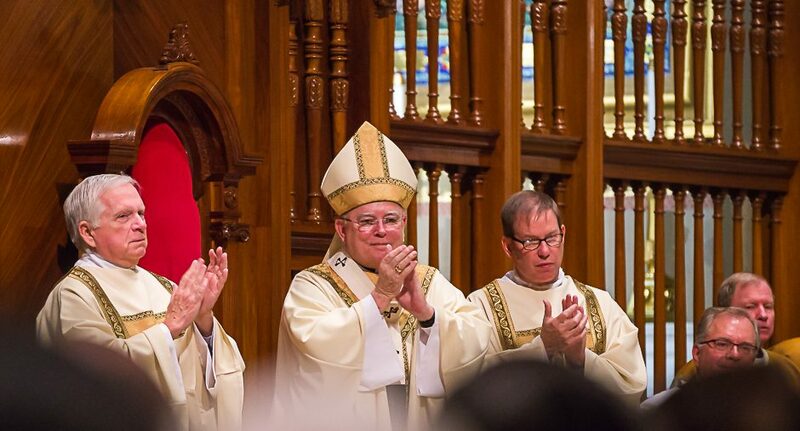 Archbishop of the Archdiocese of Philadelphia Charles J. Chaput, O.F.M., Cap. has confirmed the remains of Saint Katharine Drexel will be moved, when the time is right, to the Cathedral Basilica of Saints Peter & Paul, and placed near the altar already honoring her. She is the second American-born person ever to be canonized. 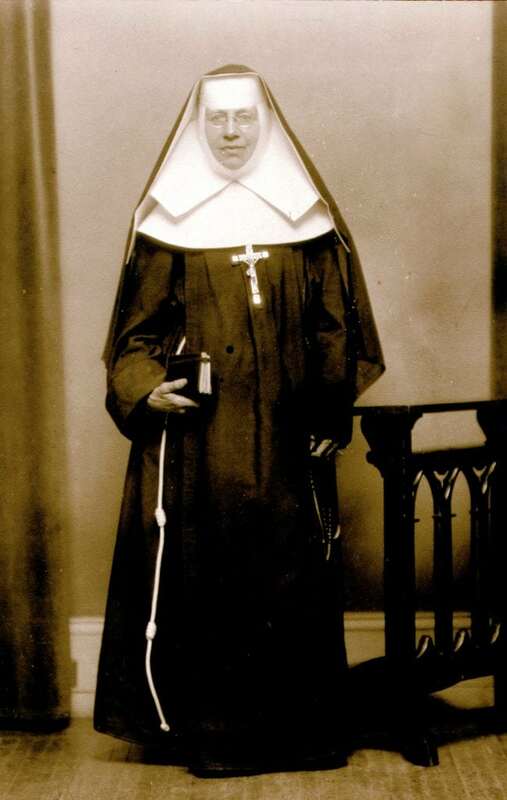 In addition, the Sisters of the Blessed Sacrament are entrusting many of their archives to the care of the Archdiocese of Philadelphia, especially because Mother Katharine Drexel and her family played such a central role in supporting the Catholic Church in Philadelphia. The Congregation has retained Plante Moran REIA as its exclusive real estate asset investment advisor to manage the disposition of both properties using a request-for-proposal (RFP) process. Click here to read/download the entire press release. 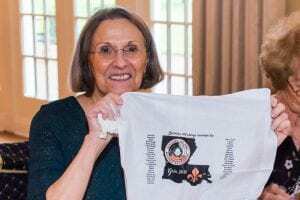 High resolution JPGs of the Motherhouse campus, of Sister Donna Breslin, SBS accompany this release and can be found at this link. 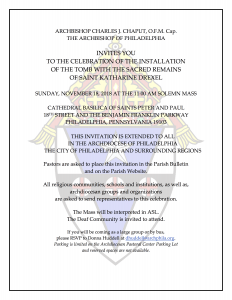 Click here to view the statement from the Archdiocese of Philadelphia on their website.